Stem cells have capable of renewing themselves through the process of cell division. It is the undifferentiated cell which have potential to develop into many different type of cells in the body with a more specialized function such as muscle cell, blood cell or brain cell.It can repair damaged tissues. cartilage repair and cleft plate repair,Genetic or inherited disorders like canavan disease,cystic fibrosis,sickle cell anemia, thalassemia etc. Why should you save your baby's umbilical cord blood ?Ensure your baby's life will be a healthy and happy one. The umbilical cord blood is being used on an experimental basis as a source of stem cells,as an alternative to bone marrow or circulating blood. The other two sources viz.bone marrow and circulating blood exist in all healthy human being. 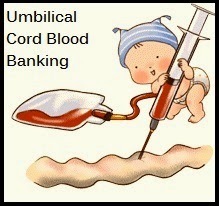 But cord blood which is another important source of stem cells can only be harvested at birth. It can morph into all sorts of other blood cells. These are ultimate source for treating diseases that harm the blood and immune system.So it is a potential gold mine for the treatment of these diseases.